The ‘Granite City’ is a term often used for Aberdeen, Scotland’s grand city situated on its north-eastern coast. It gets its name from the spectacular buildings built out of granite that grace the streets of this busy city. The buses are interesting as well, as you will see on this independent transport videos DVD programme. We begin with some archive cine film from the late Bob Webster’s collection. Filmed in the late 1960s and 1970s we see the buses of the erstwhile Aberdeen Corporation in their smart green and cream livery going about their daily business. We see buses from the long lost manufacturers of AEC, Daimler and Leyland. Some buses from Alexander (Northern) are also captured on the film. This then brings us nicely to the contemporary bus scene of 2018, when our cameras paid a two-day visit to Aberdeen to record the action for you to enjoy. The main operators you will see are Firstbus and Stagecoach. The UK headquarters of Firstbus is in Aberdeen and an interesting and varied fleet awaited our cameras. Interesting single-deckers included Volvo B7LA articulated Wright Eclipse Fusion buses and Van Hool A330 Hydrogen fuel cell buses. Stagecoach also operate similar hydrogen buses in a similar livery, but with Stagecoach fleet names. Firstbus also operate a fleet of ADL Enviro 500 double-deckers, similar to the type in service in Hong Kong, but the Aberdeen vehicles are built with a single door. Firstbus have introduced ‘Platinum’, a premium brand on some routes in the city, with a smart livery featuring black with teal, gold or green trim depending on the route. Stagecoach also have their ‘BuchanXpress’ branded coaches that run along the coast linking the towns and villages between Aberdeen, Peterhead and Fraserburgh, finished in a striking black and purple livery. Stagecoach also operates a small fleet of ‘Electric Hybrid’ ADL E350 Enviro 300 bodied single-deckers in their two-tone green and white livery. Our filming locations include Union Street, Castle Street, Market Street, Guild Street and Union Square Bus Station. Further filming takes place in King Street and West North Street. Some of these locations can still be recognised from the cine film footage seen earlier in this programme. We leave Aberdeen and call in at Montrose further down the coast for a brief visit and see Stagecoach buses on local services as well as the X7 coach on its way to Aberdeen from Perth. 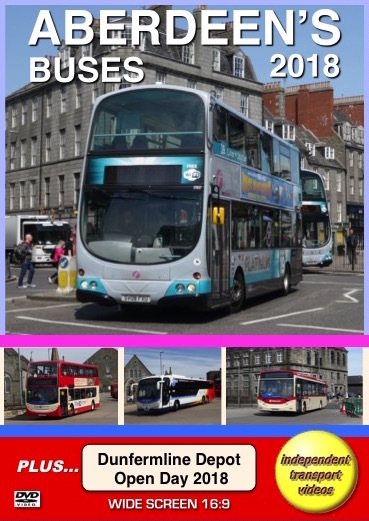 The second part of this DVD programme features the celebrations for 100 years of Dunfermline Bus Depot. This was an open day event put on by Stagecoach East Scotland on Saturday 19th May 2018. Our cameras were at the depot to record the festivities. We take a ride on a former Central SMT Bristol Lodekka FLF to the busy bus station in Dunfermline to film the action there. Stagecoach repainted 27532 (SV57 BYM), an Enviro 300 single-decker and double-decker Enviro 400, 19666 (SP60 DPK) in to the former Alexander (Fife) and Fife Scottish red and ivory liveries respectively for the occasion. We see them in action and also ride on 27532. The opportunity was taken at the event for the company to launch their latest Volvo B8RLE Plaxton Panther LE coaches. A fleet of nineteen now operate from Dunfermline and Perth depots on services to Glasgow and Edinburgh, though we see one of them operating on the park & ride shuttle service provided for the open day. We hope you also enjoy the celebrations as much as we did filming them along with the Aberdeen section of this itv programme.